What’s just as important as making good craft beer? Making sure it is available to the people who want to enjoy it. Ever since the repeal of Prohibition in 1933, there has been a three-tier system of distribution for alcoholic products in the United States, overseen by the U.S. government. The first tier is the supplier or producer—in the case of beer, a brewery. The second tier is the distributor or wholesaler, which purchases the product from the supplier, and then sells it to those in the third tier: the retailer—bars, restaurants and stores that sell the delicious products to consumers. However, a new company is looking to disrupt this 80-plus-year-old distribution paradigm. 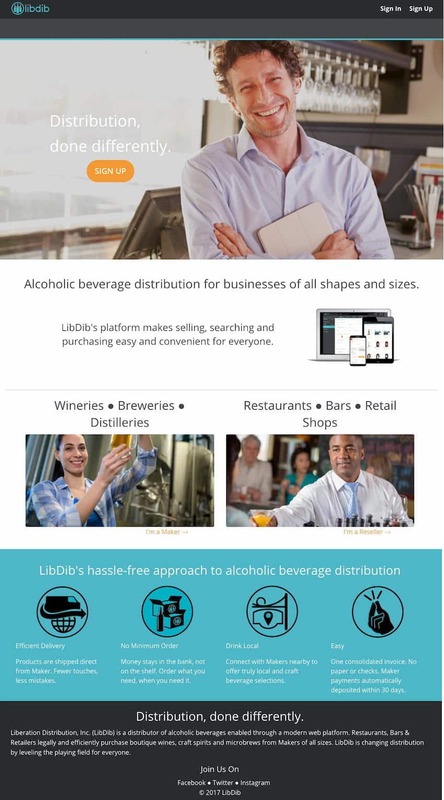 Liberation Distribution, aka LibDib, is offering what it calls the first three-tier web-based distribution platform. LibDib creates an opportunity for makers and retailers to work together directly—thus giving restaurants, bars and stores access to a larger variety of boutique craft libations. Launched on March 22, the San Jose-based company has more than 250 accounts in California thus far, and has moved on to New York. It’s really crazy, all of the industry consolidation that’s happening. … I spent 20 years in the wine business, managing wholesalers. … Every year, I would make numbers, but a distributor of mine would go out of business, or they’d get acquired, and then we would be at the bottom of the wrung at a giant distributor. It was like pulling teeth. When you take control of your own destiny, as a sales person, as a brand—that is when you can be successful. When you have a distributor in between that is beholden to larger companies … (you’re) not going to be top of mind. My whole goal is to learn how we can facilitate legal three-tier sales. That’s really important: We are part of the three-tier system. But how can we enable small breweries, wineries and distilleries to do business with other small businesses—grocery stores, bars and restaurants—where there are thousands and thousands of them, without a giant company in between? We built a two-sided web platform. For the maker, what we call our supplier, they can go in and put of all their materials online. … As a distributor, we collect the money. We pay the maker. We pay the taxes. We do all the things we have to do as a distributor. We take half the margin—that’s anywhere from 15 to 20 percent of whatever product you’re talking about. The maker is responsible for delivery. It’s been really interesting so far. A couple of the breweries that we have, they were self-distributing. But now we’ve kind of brought them back into the three-tier system, because we’re taking care of a lot of the things that they don’t want to do: They want to go out and sell their brand. They want to make their beer. But they don’t want to collect. They don’t want to invoice. … We’re trying to make it easier for those guys, and we’re making it easier for the account side, because the accounts like to carry small-production craft products. But they don’t want to write 100 checks every month. Small craft products don’t necessarily fit with the current model of distributors. (Distributors) are not going to make enough money on your brand, so why would they care? In working with us, you can have that direct fulfillment, but then still have the backend of the distributor—with one invoice and one check. So, in essence, brewers are saving money and are able to get into more locations, without having to do the self-distribution work. Exactly. A lot of breweries want to fulfill, because they want to have that complete control—over the temperature, over everything. But they don’t necessarily want to do all the other stuff the distributor does. So far, it’s bars and bottle shops. We’re working on a couple of big deals. There’s a stadium that’s interested in working with us and having us get 15 or 20 taps—just totally unique, small-craft-beer stuff. Yes! I was very nervous about the wine and spirits folks, that they may not be happy about this. But for the most part, they’ve been pretty accepting. They recognize that with this consolidation, their bread and butter is their bigger suppliers. … Some of the little guys take away their time and effort from where they really make their money, so they like the idea. There are so many small companies that need help with their distribution. I’m going after what I call the long tail of the industry—the (breweries) that couldn’t get distribution, even if they wanted it. In terms of posting your things once, and having people from all over the world able to see it, yes. It’s definitely like the Airbnb of alcohol distribution. It’s funny: (Venture capitalists) around here will tell us, “Don’t tell us you’re the Airbnb of anything.” But it gives people an idea. You can go in; you post your product; and buyers can see it and purchase it legally.